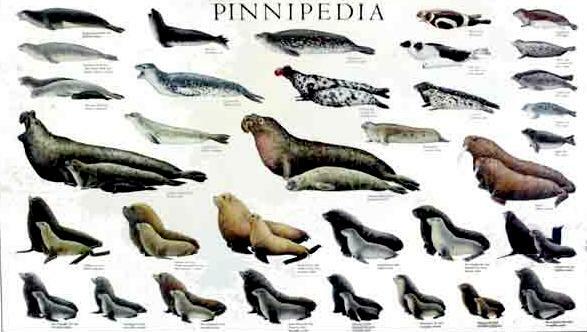 Pinnipeds are a widely distributed and diverse clan of fin-footed, semi-aquatic marine mammals. They comprise the extant families Odobenidae whose only living member is the Walrus, Otariidae the eared seals: Sea Lions & Fur Seals and Phocidae the earless or “true” seals. 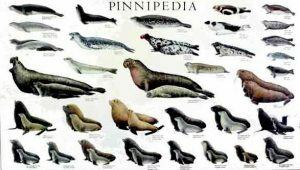 There are 33 extant species of pinnipeds and more than 50 extinct species have been described from fossils. While seals were historically thought to have descended from 2 ancestral lines, molecular evidence supports them as a monophyletic lineage descended from a single ancestral line. Pinnipeds belong to the order Carnivora and their closest living relatives are bears & musteloids. Seals range in size from the 3 foot and 99 pound Baikal Seal to the 16 foot and 7,100 pound Southern Elephant Seal. Several species exhibit sexual dimorphism. They have streamlined bodies and 4 limbs that are modified into flippers. Though not as fast in the water as dolphins, seals are more flexible & agile. Otariids use their front limbs primarily to propel themselves through the water, while phocids and Walruses use their hind limbs. Otariids and Walruses have hind limbs that can be pulled under the body and used as legs on land. By comparison, terrestrial locomotion by phocids is more cumbersome. Otariids have visible external ears, while phocids and Walruses lack these. Pinnipeds have well-developed senses, their eyesight & hearing are adapted for both air & water and they have an advanced tactile system in their whiskers or vibrissae. Some species are well adapted for diving to great depths. They have a layer of fat or blubber under the skin to keep warm in the cold water and other than the Walrus, all species are covered in fur. Male pinniped strategies for reproductive success vary between defending females, defending territories that attract females and performing ritual displays or mating. Pups are typically born in the spring & summer months and females bear almost all the responsibility for raising them. Mothers of some species fast and nurse their young for a relatively short period of time while others take foraging trips at sea between nursing bouts. Walruses are known to nurse their young while at sea. Seals produce a number of vocalizations notably the barks of Northern Sea Lions, the gong-like calls of Walruses and the complex songs of Weddell Seals. The meat, blubber and fur coats of pinnipeds have traditionally been used by indigenous Peoples of the Arctic and seals have been depicted in various cultures worldwide. They are commonly kept in captivity and are even sometimes trained to perform tricks & tasks. Although pinnipeds are widespread, most species prefer the colder waters of the Northern & Southern hemispheres. They spend most of their lives in the water, but come ashore to mate, give birth, molt or escape from predators like sharks and Killer Whales. They feed largely on fish & marine invertebrates but a few like the Leopard Seal, feed on large vertebrates such as penguins and other seals. Walruses are specialized for feeding on bottom-dwelling mollusks. Male pinnipeds typically mate with more than one female (polygyny), although the degree of polygyny varies with the species. The males of land-breeding species tend to mate with a greater number of females than those of ice-breeding species. Once relentlessly hunted by commercial industries for their products, seals are now protected by international law. The Japanese Sea Lion and the Caribbean Monk Seal have become extinct in the past century, while the Mediterranean Monk Seal and Hawaiian Monk Seal are ranked Critically Endangered by the International Union for Conservation of Nature. Besides hunting, pinnipeds also face threats from accidental trapping, marine pollution and conflicts with local native peoples.